Relentless, the only way that innovation will save you. Who wants to be in Nokia’s shoes these days? Who wants to swap jobs with Stephen Elop? We see a steady drop in revenue. Also the strategic shift from Nokia’s own platforms towards Windows mobile and the Micrsoft coop did not result in a turn around. This chart shows one of the reasons: Apple just takes over on the right. Keep in mind that the diagram is in logarithmic scale. In sheer numbers, Apple has increased his revenue five fold from 25 to 125 billion / year, while Nokia lost 2 /3 of his revenue, dropping from 60 to 25 billion / year. Nothing much to say here: Nokia is still one of the largest vendors of feature phones (that is: plain normal cell phones) but it does not even get a place under first five vendors of smartphones. Nokia only exists in the low margin world of very basic cell phones. But the market was still ruled by so called feature phones, plain normal dumb but useful mobile phones. U could make calls with them and this in good quality and for a long long time. On top oft hat some quirky games were developed, texting of course, some experiments on social sharing and other gadgets. 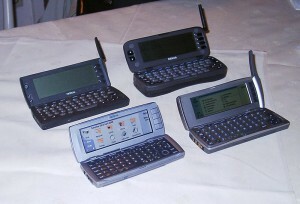 The market of feature phones was taken and dominated by Nokia, the former paper mill and producer of excellent rubber boots. Nokia was admired and everybody’s darling for radically reinventing itself. And with each re-invention, Nokia did not just disrupt itself but a whole new market and thus conquered it. And now? Today? What has happened? And: Could it be predicted? Step 1: Mystery - The company discovers a mystery, a problem and wonders. 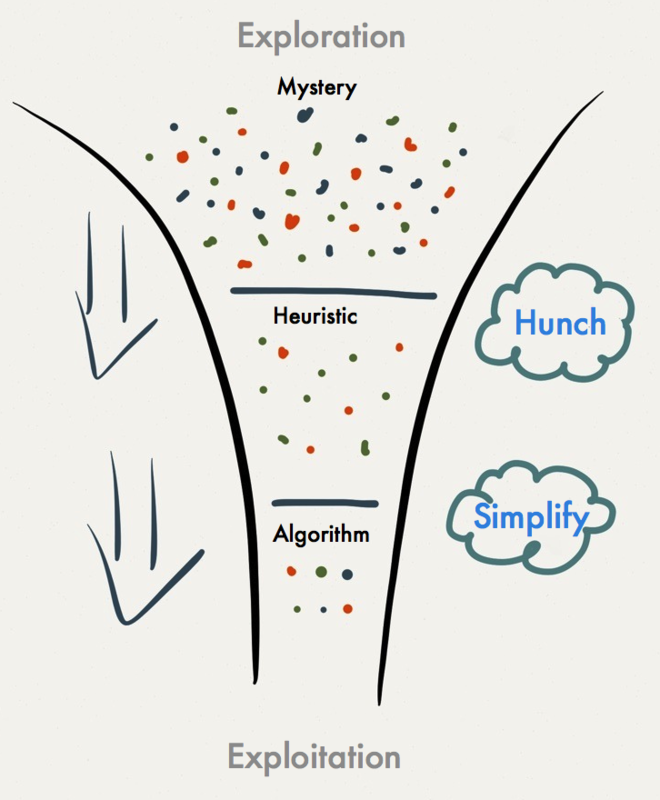 Step 2: Heuristic - The company solves the problem, piece by piece by discovering heuristics. On this level one has not yet understood the principles of the solution but more or less stumbled towards solutions. One is still looking for patterns. To speed this process up, the company needs to make lots of experiences as fast as possible by conducting many experiments, possibly in parallel. Step 3: Algorithm - On this level, the company has understood the pattern, the mechanics of the solutions. Now the solutions can be scaled. Examples for scaling are a good online platform or a franchising model (like Starbucks automated the pattern of selling coffee with high margin by selling the experience of the third place or McDonalds automated the family friendly junk food grill). This is just what Nokia did. They discovered a problem / mystery and were looking for solutions on the level of heuristics like crazy. Because the problem (and the potential) was huge and hard, solving the problem had enormous consequences. A new market emerged and Nokia needed to reinvent and transform itself completely to finally be able to deliver to the demand of the new market. These are all typical attributes of disruptive innovation. Sadly, what followed for Nokia is also a classical move for grown companies – even though untypical for Nokia. Most companies stumble right into the symptoms of the Innovators Dilemma after phases of bullish growth. 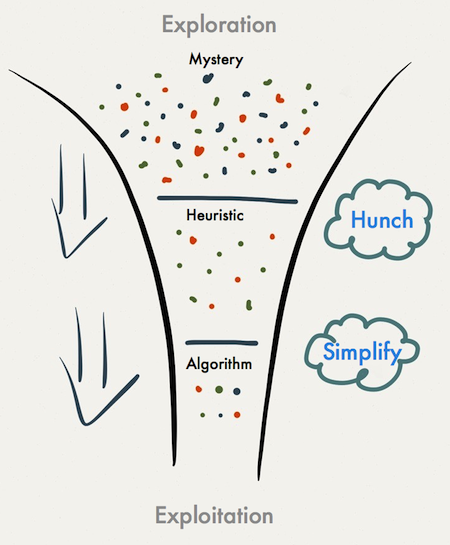 Tuning the algorithm (now: the product) by small feature tweaks. Growing the capabilities on operational excellence in all areas from product to development to production to billing … you name it. All that is honorable and necessary. It can even be adventurous, demanding and breathtaking. But there’s one thing it is not: Innovative. And so it brings with it the effects of changing personnel and culture. Predictability is now what counts and what is demanded from the same people who have just created a new market. And there’s valid reason for that demand. Investors, press and the public all want to know what’s going on. But the side effect is that now predictability from past events and thus repeatability are now in the focus of the companies thinking – rather than new opportunities. You could call that an analytical mindset. And that mindset completely fulfills the targets of operational excellence. But what the company looses with optimizing the predictable change in the small is the capability to change in the big picture. And thus the whole company is predictable and the model can be copied. By taking a closer look at the knowledge funnel, one problem gets revealed: Once you discover a problem or myth and start wondering about it, nothing can be predicted about its potential, solvability and profitability. This, in a pure analytical culture has far reaching consequences. Those on the lookout new opportunities, from their personal structure and the nature of their work have a huge disadvantage in meetings, because they cannot make hard statements on the feasibility or coming profits of their work. Quite different those, engaged in improvement opportunities, and changes in the small. This work is, in comparison (and if we ignore the strange ways of politics and social haggling as well s optimism bias) (Link) quite predictable and on top increase the margin of the company in the next quarters! It is crystal clear, which projects and initiatives get a chance in these meetings and which ones end up in the drawer. But this also means that those projects end up in the drawer, which are located at the top of the knowledge funnel and want to dive into it for another time. In other words, the future markets now end up in the drawer. In companies that are financially driven and want to gain efficiency first and foremost, there is no room left for deep and disruptive innovation. And this counts for all cultures that go for small changes only. This is also why efficiency movements like Six Sigma are great for short-term profit but kill off innovation. (If you don’t believe me, because for example amazon is known for its Six Sigma excellence: They exactly know where they apply Six Sigma and where they avoid it like the devil.) By driving its efficiency to new levels by optimizing in the small, the company gets blind for the environment, for the black swans, for disruptions from the outside and finally is fragile and utterly vulnerable – although looking financially sound, stable and healthy to the outside. Nokia 2008, any one? Companies can account for knowledge and Innovation by repeatedly diving through the knowledge funnel. The efficiency of the company needs to always be improved in a kaizen manner. On top of that, seemingly wasteful innovation needs to be protected by providing room and resources. It is important that both aspects are established as protected containers in the company, which should communicate immensely but do not constrain each other. Innovation will die off under the constraints of production. And also efficiency gains will not be optimal when defocused by the slack and partial (and necessary) ‘chaos’ and non-linearity of innovation. Again, the important point is to be aware of this mechanism. In a way it may be the biggest accomplishment of Apple, to be aware of this cycle and to act upon it: To increase the capabilities, efficiency and repeatability (and not just capacities) of the supply chain to incredible heights and at the same time devote huge amounts of room, slack and resources to the design driven innovation process. The effects are known; in the last years Apple could again and again slip faster through the knowledge funnel and define new product categories. But, we don’t have to take such an exposed example. We can also look at Steelcase, Procter and Gamble and others who discovered the power of the combination of deep design with working on efficiency. Roger L. Martin calls this to balance between or coexistence of validity (doing the right thing) and repeatability (doing things right). The ability of a company to innovate is hard to judge locally. To feel safe the way that Nokia did and then fell over is a sword of Damocles for each company that does not innovate relentlessly in a disruptive way. Black swans are lingering around the corner. As a company, to gain anti-fragility, it has to be taken care that the knowledge funnel is passed repeatedly and relentlessly. By ensuring this, the Innovators Dilemma is avoided, with the effect of the discovery of new opportunities and new markets as a consequence of continuous learning. This brings the chance to continuously serve new markets. If one of the markets breaks away, because we are out-competed, we enough other markets left as a basis to build upon. If a black swan comes along and we are outcompeted on of our markets, we have enough markets and opportunities left to survive. Management of innovation is important, while we have to give in to the lavishness of Innovation and the unfamiliar non-linearity of innovation processes: Not every problem delivers a new market and not every problem can be solved in a profitable way and ‘in time’. Also many problems are obvious and other could be quicker. But the highest risk is not to innovate. In some of the next posts we will dive deeper into the ‘What’ and ‘How’ of innovation. If you have remarks, questions or whishes on topics or aspects of innovation, we’d be happy to hear from you in the comments! I just found a shorter piece on the topic by Tom Hulme: ‘Watch the Disruptors not the Incumbents‘. [Taleb 2] Nassim Nicholas Taleb: Antifragile: Things That Gain from Disorder. New York: Random House. 2012. ISBN 978-1-4000-6782-4.